Leigh Olson: This is The Heritage Cookbook Project Podcast where we connect with cooks across the country to talk about food memories and family recipes and learn just a little bit more about one another. And I’m your host. Leigh Olson . Monica Lo: My name is Monica Lo. I am currently residing in San Francisco. I’m a photographer and creative director working with various brands in the food and cannabis industry. I’m also the creator of the blog called Sous Weed. 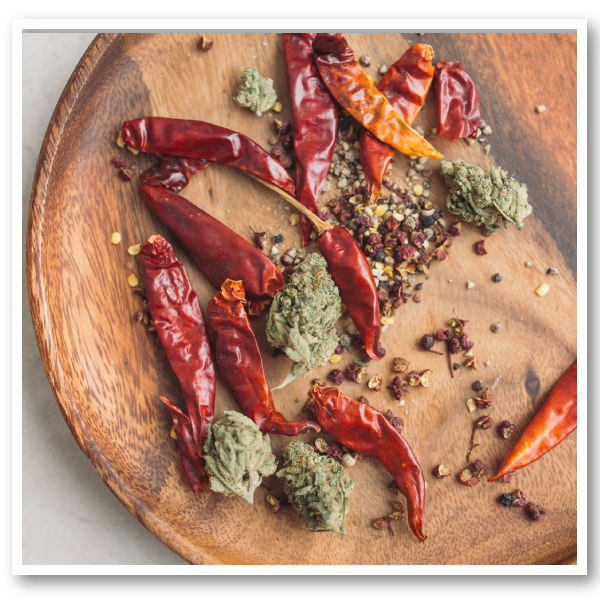 Leigh Olson: In my chat with photographer and culinary cannabis chef, Monica Lo, about Medicated Spicy Sichuan Wontons. I learned how what’s packed in a lunchbox can inspire pride in a culture where the first recorded medical cannabis use originated. And that your nose, knows. Leigh Olson: What was your first memory of being in the kitchen? Leigh Olson: What does a perfect dumpling look like? Monica Lo: Well, my mom likes the perfect pleats. Um, so that’s what I do these days. But back then we would try to make all sorts of creatures, uh, um, weird shapes. Uh, but when you boil them up, it just kind of looks like a mush. So the pleated one’s always came out the best. Mom always won. Leigh Olson: Of course she did. And how did you folks end up in Texas? Monica Lo: Um, they both immigrated to attend college in, in Dallas. Um, I was born in Texas, so I’m a second generation Asian American. Um, but it was not an easy childhood. There were a lot of learning curves. Um, my lunchbox didn’t quite look like everybody else’s, but, um, sometimes it would be a packet of seaweed sea go with the rice and you know, kids would be like, that’s super gross, but that’s okay. Um, you know, we kind of owned it like we liked our food, it tasted delicious. Um, and, and we’re proud of that. Leigh Olson: It sounds like there were a lot of traditional and cultural heritage that informed and inspired your view on food. Can you share a little bit more? Monica Lo: I pull a lot of Taiwanese and Chinese influences from my parents. There’s this part of me that’s yearning to learn more about the ingredients and um, just the techniques that my family and my ancestors have passed down. My mom has been a huge inspiration and her, her food has been so healing. Um, she’s also got this sixth sense of knowledge of herbal medicines. So in a way I feel like what I’m doing with Sous Weed is an evolution of her methodology using cannabis and food to heal. Um, and learning about all these other herbal medicines. I had been talking to my mom a lot and just getting recipes from her recipes from our family in Taiwan, um, translating them and using them in my day to day cooking. Heritage preservation is pretty important to me these days. I want that deeper sense of identity and a stronger bond to my ancestry. And I see the importance now in safeguarding some of these traditions and the flavors that I’ve inherited, especially as I get older and my parents as well. Leigh Olson: You mentioned in an article that you had written that the Asians have this historical connection to the cannabis plant, which is something that you, um, have have really embraced in your cooking. Monica Lo: I learned that the first recorded medical cannabis use came from China. And hemp was first discovered in what is now modern day Taiwan. So this is all pretty exciting to me. Um, cannabis is used to to make ointment and teas to treat various diseases. But during the opium wars in the cultural revolution, a lot of antidrug propaganda spread and punishments often carry the death penalty. Um, which is why it’s still highly stigmatized in Asian countries. Leigh Olson: How did that inspire you to start Sous Weed? Monica Lo: There’s a lot of misinformation out there. Research and education is still needed to help set the record straight. And that’s something I’d like to, to help with, um, through my Sous Weed platform. Um, just lots of, yeah. Recipes, uh, no recipes or something that everyone relates to. Everyone eats. I want it to come across as very approachable, um, and friendly. There’s so much that about cannabis and a lot of misinformation too. I wanted it to be simple and to come across as you know, very, um, that it’s doable that every home cook can go and create something that is lightly medicated and can be used to help heal themselves. Leigh Olson: Coming up after the break. Cooking underwater heritage preservation and why a second generation Taiwanese American has Sichuan Wontons in her family history. Sponsor: This episode, the Heritage Cookbook Project Podcast is supported by Bob’s Red Mill. When you’re making those treasured family recipes, don’t leave the quality of your ingredients to chance. 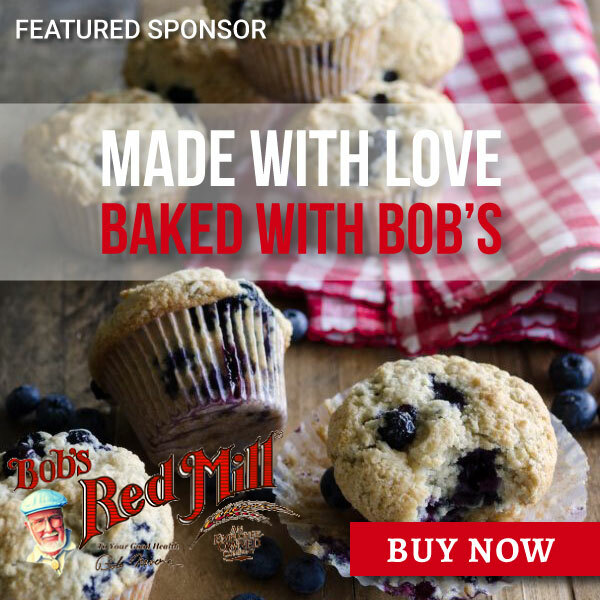 Visit Bob’s red mill.com to find out more about this employee-owned company, their products and how you can fill your pantry with them. With their products, not their employees. Leigh Olson: And now back to Monica and the Medicated Spicy Sichuan Wontons. Monica Lo: The rest of my family’s from Taiwan and we identify as Taiwanese, but my grandfather was born in the Sichuan Province of China, which is why I probably less spicy food so much. um. And the recipe is session one times and they’re stuffed with minced pork and Chinese chives that are drenched in a spicy Red Chili oil that I’ve infused with cannabis using the sous vide method. Leigh Olson: Can you talk about a little bit about, sous vide? Monica Lo: Yeah. Sous vide refers to the process of placing your food in an airtight bag and cooking underwater at a precise temperature. So it’s perfect for infusing cannabis into an oil or a fat base. Since the cannabis and the oil are sealed in a bag together, there’s no smell and there’s no need to babysit a stove top or crock pot. Um, and with that oil base, you can make all sorts of things. You can include that into all of your recipes. Um, and for this instance into the Red Chili oil that goes all over the wontons. Leigh Olson: And then when you’re infusing the oil, you’re getting both the CBD and the THC in that oil, is that right? Leigh Olson: When you’re making a recipe. How do you choose either the THC heavy or the CBD heavy strain? Monica Lo: So, to choose the strains. I, luckily I live in California and I’m buddies a lot of different farmers and brands. Um, and they’ll, they’ll usually tell me, you know, this one’s higher in THC, that’s one throwing CBD or they’ll have a general gauge of what the effects are like on them. Um, and that’s, that’s how I’ll, I’ll play with the different strains and you know, it’s like collecting ingredients. Every strain will have a different effect. So I’ll make all sorts of different infusions, see how they feel and that way I can pair it with a certain dish. Um, if it’s a daytime meal or a smoothie in the morning, I’ll go for something lighter, a little bit more CBD. And then at night when I want to sleep really well, um, I’ll infuse some THC into my sauces for dinner or into the dessert and, and then I’ll have a great night’s sleep after that. Leigh Olson: So do each of the strains have different flavor and how does that affect the overall dish itself? Monica Lo: So there’s a lot of different strains out there, different flavor profiles and we like to call those flavor profiles, the turpines. Um, so it’s pretty much like the essential oils from, from the cannabis bud and it smells from all sorts of different ranges. It could be piney, it could be lemony, could smell like lavender or it could be peppery. All sorts of different essential oils, all sorts of different turpines. And that’s how I pair it with my dishes. So something that’s a little bit more lemony might work great for a dish with seafood or in a dessert. Um, things that smell like strawberries would work great in something that’s maybe like a salad dressing or in a dessert. Again, um, and things that are a little heavier earthier um, maybe peppery. I like to work into my main entrees. Leigh Olson: How do you know what these flavor profiles are? Monica Lo: So just use your nose. Um, if it smells sweet, if it smells fruity, definitely use that for something that pairs well with that. If it smells funky and, and garlicky or earthy, you might want to use that for something more savory. Leigh Olson: So you can really rely on the fact that what you’re smelling is what you’re going to taste. Leigh Olson: So if our listeners wanted to make the Spicy Sichuan Wontons, is there one piece of advice that you would give to them? Monica Lo: Yes. Um, so it, it’s very time consuming to wrap all the wontons. So I would say make the wontons in bulk. Make the the base first, which is the, then meat, uh, the ground pork and Chinese chives. There is, um, garlic in there as well, and some extra seasonings. And then you fold it up into little wontons. I just get the premade dough these days. I, I just don’t have time to make dough like my mom did, but the wrappers you can buy at any Asian grocery store. So I get the wonton wrappers, I stuffed it with the minced pork, um, wrap ’em up and I freeze them. So much like my childhood dumplings. 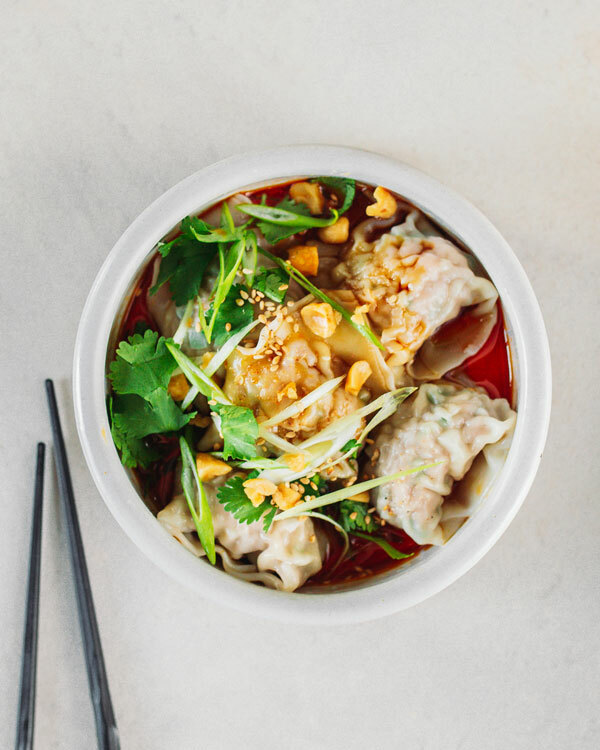 We’d make the wontons in bulk freeze them and the day that you want to serve, all you need to do is pop it in to boil for five minutes, serve them in a bowl with the oil and top it with cilantro and chopped peanuts. It’s super simple. Leigh Olson: I want to thank you so much for taking the time to be here today. I’m super, super excited that you want to be part of this project and I’m just, I’m honored. Monica Lo: Oh Gosh. Thank you so much and I’m honored to be on this and I, I love chatting with you. Leigh Olson: If listeners wanted to find out more about you and what you’re doing, where can they find you? 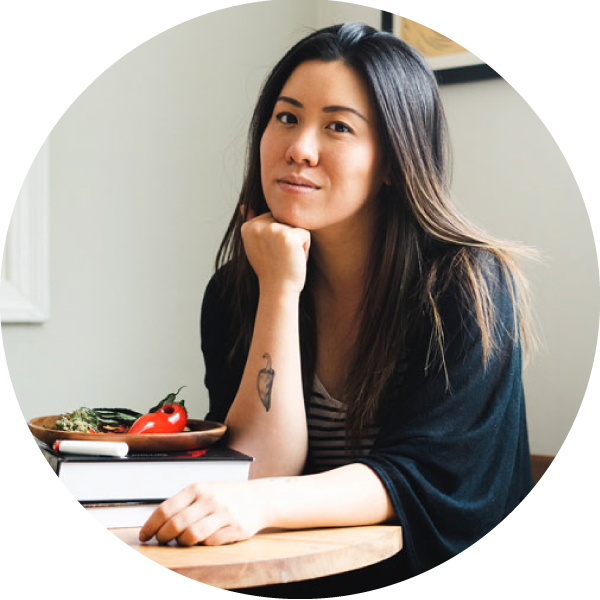 Monica Lo: So if you want to find more sous vide cannabis infused recipes, you can head over to Sous Weed dot com and you can also find me on Instagram at Sous Weed. Leigh Olson: If you enjoyed hearing Monica’s memories about Spicy Sichuan Wontons and want to hear more stories like this, please subscribe wherever you get your podcasts. And if you could step away from the sous vide for five minutes and leave a rating and review, it will help me reach more people like you who love stories about food. The full recipe for Medicated spicy Sichuan won tons can be found at the heritage cookbook, project.com and don’t forget to register for access to the printable cookbook pages. Cheers. Oh, and the strain that Monica likes for the wontons is called GMO, garlic, mashed onion. 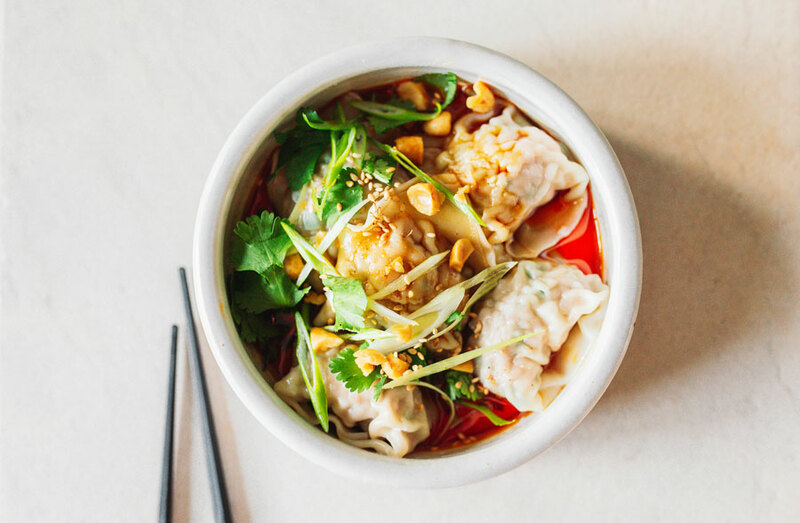 It’s garlicky and earthy and it’s perfect in the chunky chili oil that you drizzle over the wontons. I connect with Monica Lo, of Sous Weed, who shares her family’s tradition of dumpling making, her belief that food is medicine, and her culinary cannabis platform. Sous vide machines can be confusing, but Monica recommends either the Nomiku or Joule. You can connect with Monica on her website, Sous Weed – remember you have to 21 – or on her Instagram account. To make wonton filling, combine ground pork, salt, sugar, white pepper, Chinese chives, garlic, and Shaoxing wine in a medium bowl and knead until uniform, about 1 minute. To form the wontons, set a wrapper on your work surface in the shape of a diamond. Place a tablespoon of filling in the center of the wrapper. Gently moisten the edge of the wrapper with water. Dry your hands before folding one corner of the wonton wrapper up to form a triangle. Seal the edges, pushing all air out as you work. Pull the left and right corners together and pinch to seal. Transfer wonton onto a parchment paper lined baking sheet. Repeat until finished. 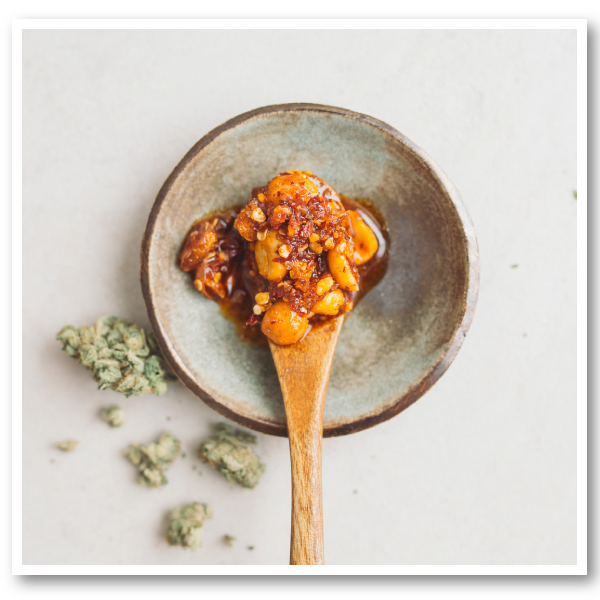 To make the sauce, combine medicated chili oil, ground Sichuan pepper, toasted sesame oil, Chinkiang vinegar, soy sauce, sugar, and garlic in a small bowl and mix well. Set aside until ready to serve. To cook, bring a large pot of water to boil. Add 12 wontons in to cook, about 4 minutes. Cooked wontons should float. Drain wontons and transfer to serving bowls. Spoon the spicy sauce on top and make sure all wontons are covered. Garnish with toasted sesame seeds, cilantro, and chopped peanuts. I want that deeper sense of identity and a stronger bond to my ancestry.